When we first stared working on Mezcal Reviews, Jonny and I thought that once we had about 100 bottles on this site, we’d be struggling to find more to add. As of this writing, the site has 260 bottles and we’re not slowing down! Over the last few months we’ve tried a lot of mezcal, “collected” some mezcal, met brand representatives, and even took our first trip to Oaxaca. Naturally a bias will develop towards certain brands or mezcaleros. 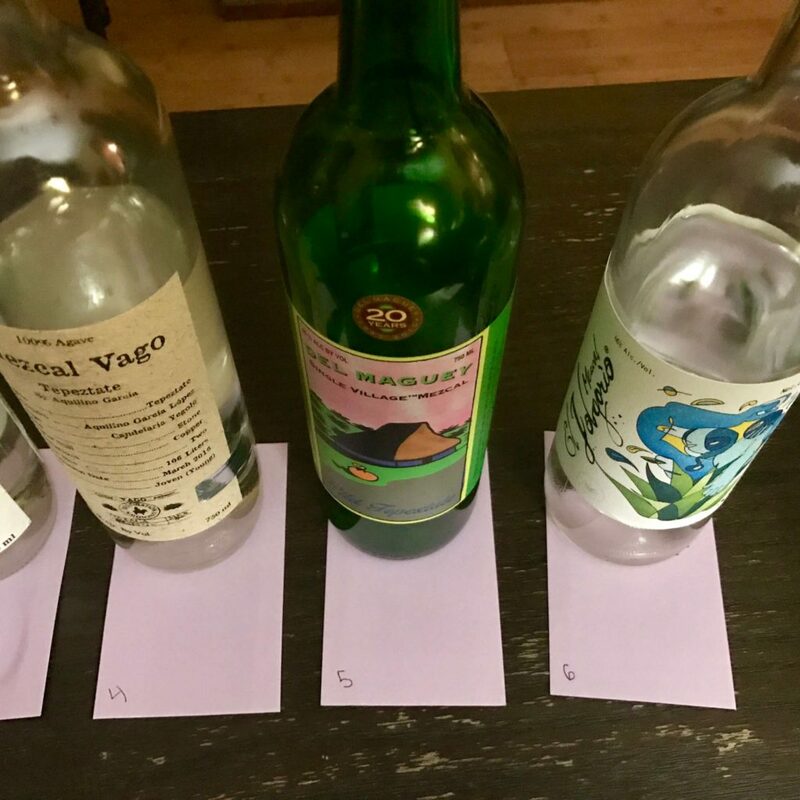 We decided to do a blind tasting in an attempt to remove bias and also see if our palates could tell the difference between a $70 mezcal and a $130 mezcal. Keep in mind, we’re not “mezcal master sommeliers”.. though that title sounds really cool. We’re just like most of our readers, we’re mezcal nerds. If you’ve tried some of these mezcals please add your comments below or better yet, write some reviews. Once finished, flip the cards over to reveal the mezcals.. then check your notes against the numbers. 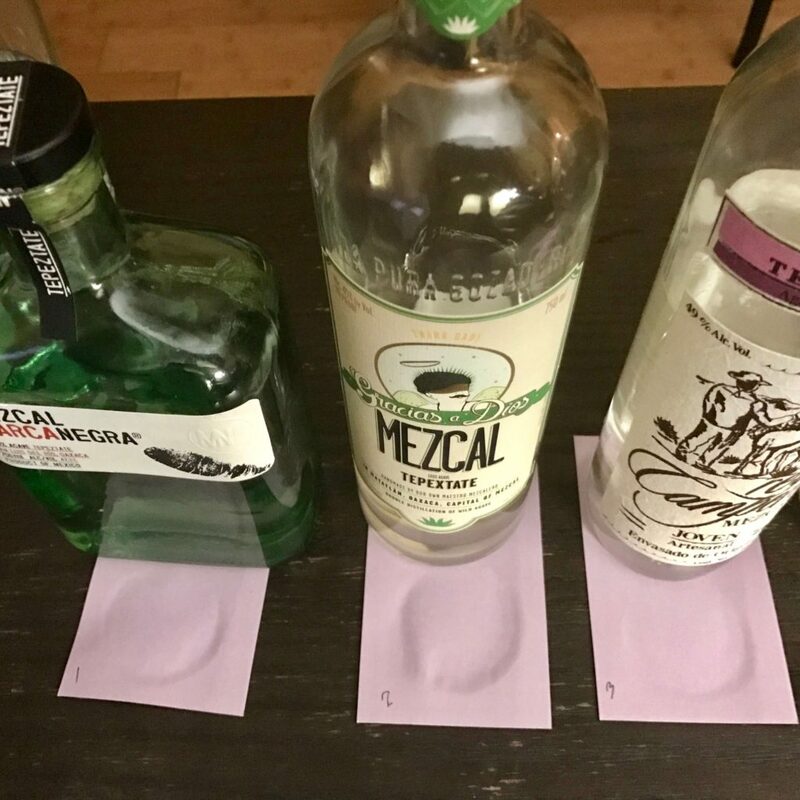 For our first ever blind tasting we decided to have a 100% agave Tepextate/Tepeztate mezcal tasting.. as you might imagine, it was quite the “tepez-tasty” evening! 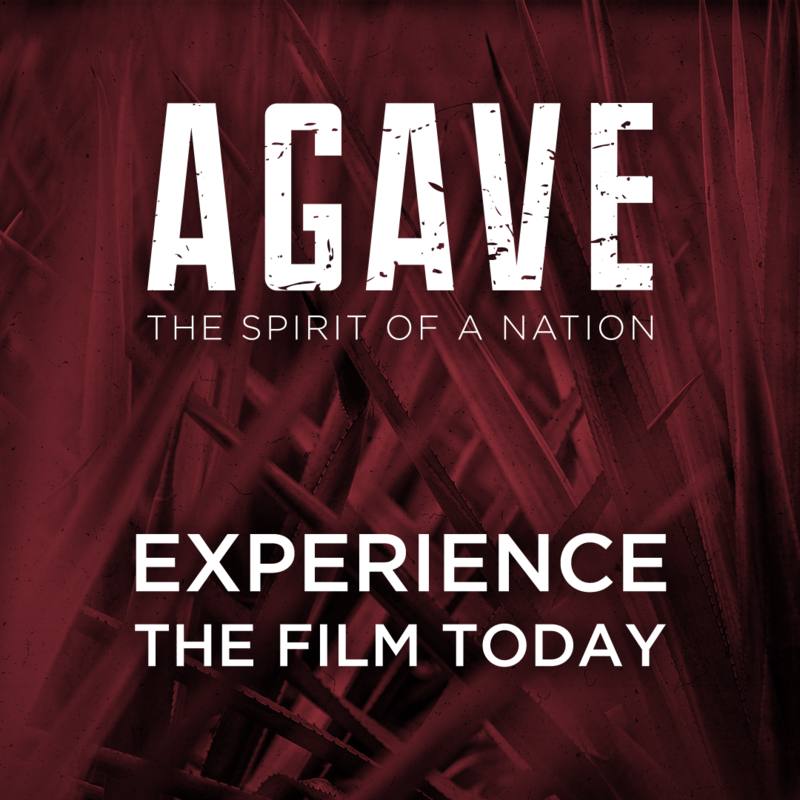 Agave tepextate is one of the most interesting and rare agaves in Mexico. Agave Tepextate is part of the agave Marmorata family. Mezcal PhD’s well-researched list of How Many Varieties of Agave Can Be Used to Make Mezcal? only has Tepextate listed under the Marmorata family (also called Agave Becuela).. so it’s either the only sub-species or the only one known for use in mezcal production. Check out the the bottom of this post for a video of agave Tepextate growing in the wild. This plant takes a very long time to mature, sometimes up to 25-35 years. Many of these wild agaves are found growing on steep grades in rocky soil. Their leaves are broad and wavy. 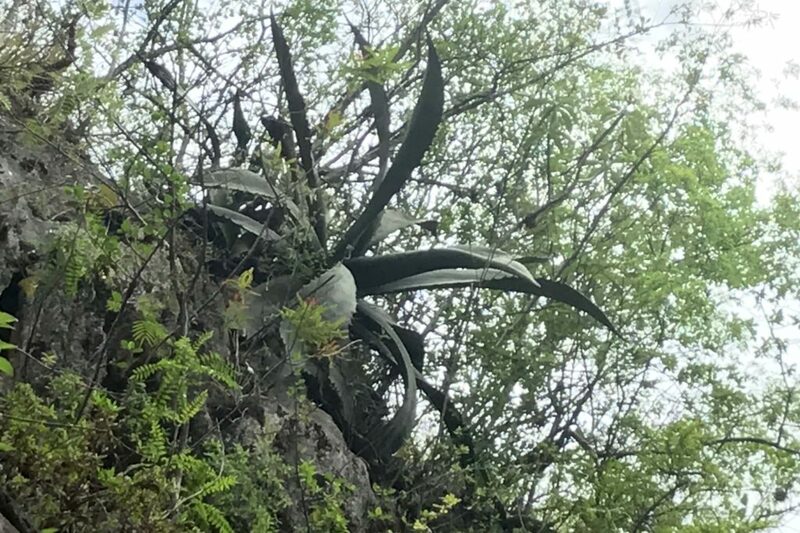 Sometimes the agaves grow hanging horizontally from mountain cliffs which makes extracting the plant for mezcal dangerous. Mezcals made from Tepeztate have very distinct aromas and flavors. For me, a good Tepextate tastes like the perfect mix of freshly cut sweet and spicy peppers, intensely vegetal and earthy but not overpowering. Considering the rarity of agave Tepextate, these mezcals ain’t cheap. If you’re getting a pour at a bar, expect to pay at least double of what a pour of Espadin might cost. Considering that, you might as well just get a bottle! All of these mezcals are 100% agave Tepeztate, but the agave is used in many ensambles as well. Jonny and I pulled together our personal collections and put the following bottles in our tasting lineup. One thing that surprised us when looking at these bottles was the consistent ABV across brands. 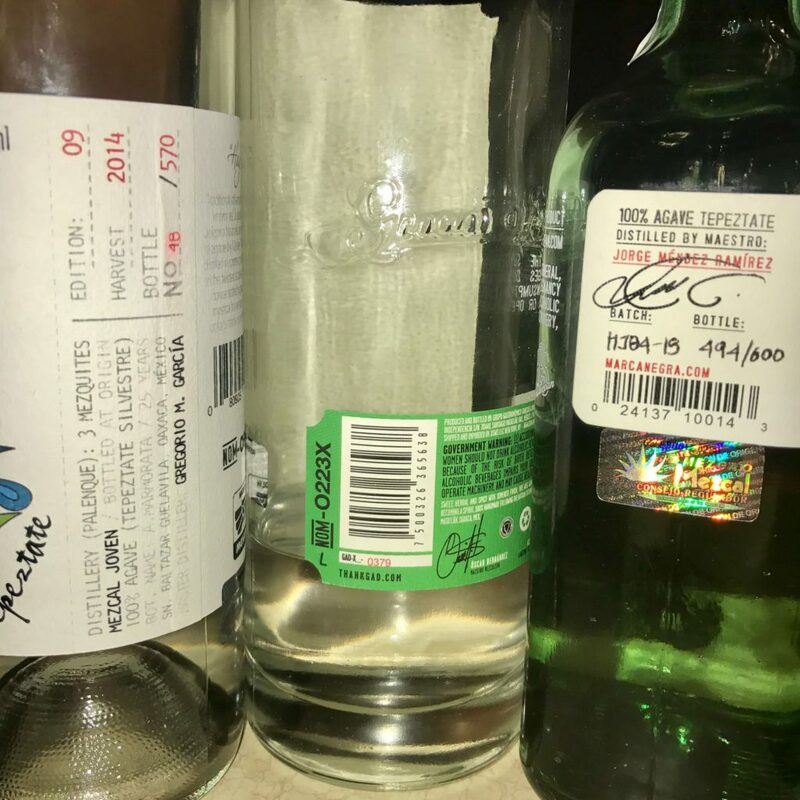 Most of these Tepextate mezcals are around 46% ABV range with the exception of the Vago which is seemingly explosive at 53.1% (more on that later). The Gracias a Dios was the least expensive and the El Jolgorio was the most expensive. Even in Austin, agave Tepextate mezcals are not found in many stores nor bars. Here is the blind tasting in the random order that we tried them. Jorge Mendez makes the Tobala and Tepextate for Marca Negra in San Luis Del Rio. Neither of us had spent much time with this mezcal before the blind tasting and our reactions couldn’t have been more different. My notes were quite opposite. Neither of us guessed the mezcal we tasted was the Marca Negra. We both correctly guessed this mezcal was Gracias a Dios. We both got a lot of fruit but differed on the heat factor. Again, we both correctly guessed this was the Rey Campero. This was one of my favorites if not my favorite mezcal of the bunch. I went back-and-forth on whether this was the Vago or El Jolgorio. After tasting the El Jolgorio I realized this was the Vago. Jonny thought this was the Marca Negra. This expression of tepextate is very approachable with well-defined flavors. We both agreed it was one of the favorites and correctly guessed it was the Del Maguey. My guess was based on the nose. We both thoroughly enjoyed this mezcal and guessed correctly it was the El Jolgorio. This mezcal has an incredible range of flavors and is a must-try. Okay.. so the blind tasting didn’t totally eliminate bias since we were able to guess the brand 70% of the time. We guessed more far more accurately than I thought we would. Also, we didn’t tell each other our predictions until after the tasting. Comparing notes before revealing the mezcals was a lot of fun and helped identify key flavors in each of these unique bottles. All of these are pretty fantastic.. we must have good taste! 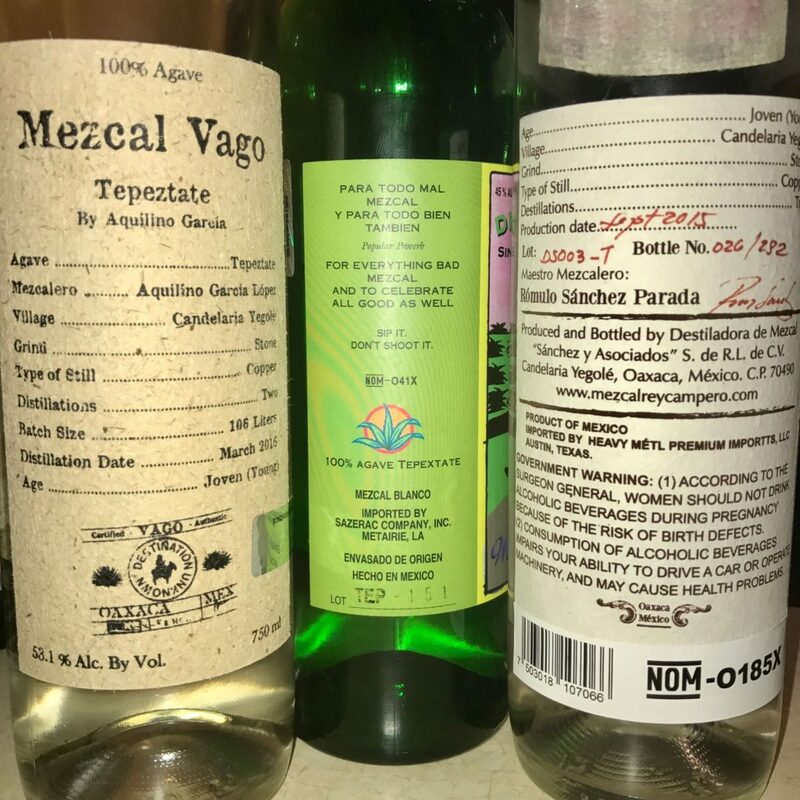 Overall I think the Mezcal Vago Tepeztate was the best for the price, though some might find it too aggressive in which case the Del Maguey might be a better option. El Jolgorio is an incredible treat but also expensive. Is the difference between Gracias a Dios and the El Jolgorio worth the $65 price difference? Some would say absolutely, others might disagree. That’s up to you. Thanks for reading and stay tuned for our next blind tasting blog where we taste mezcals made with 100% agave Tobala. Wish I could have been there for this tasting!! I bought a bottle of the Del Maguey in Mexico a couple of years ago and was very disappointed, it must have been a batch issue. I have tried two other Agave Marmorata besides Tepextate. Pizorra and Curandero. I’m not sure if these are sub species or just different words for the agave in different areas. 5 Sentidos has a Pizorra that I tried at El Destilado in Oaxaca City and it was fantastic!!! I didn’t write down my notes but I remember that we were both struck by how much it tasted like peanuts!! Fresh jalapeño and peanuts! La Botica in Mexico City makes a great Curandero with more typical Tepextate like flavors. I tried it at their Roma Norte bar on Calle Orizaba.